Waking up at the crack of dawn, hanging out with newspaper vendors and having(1/2) called " by two coffee" is definitely not a privilege of a newspaper circulation/ distribution executives job in any part of the world. However, soon after having the choice of an early breakfast at the local exotica with the team is certainly a privilege I definitely cherished. The city is Bangalore, business is over and its only 6a.m. A brisk walk in Lalbagh and we are ready for breakfast. 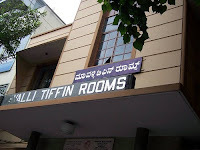 The option is hop across to MTR (Mavalli Tiffin Room), the high priest of Doasas and Karnatesque breakfast cuisine, or the highly recommended Vidyarthi Bhavan. Both have their huge following. 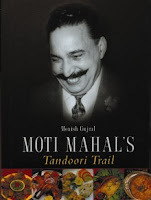 MTR with the Discovery Channel and Vir Sanghvi crowd.Whilst ,SM Krishna (the erstwhile Chief Minister of Karnatka) often drops in at Vidyarthi Bhavan. I choose to go to both, we have to get up every morning in any case (we are launching Mint the business paper with Wall street Journal), we have to congregate for breakfast in any case. Kanan, my friend and then Head of Circulation organises a breakfast meetings with the team or vendors or distributors everyday. I get to sample local exotica. The only serious clause the price has to be under Rs 100/- per head which here in Bangalore is not at all difficult. Amongst all the varied breakfast places we went to, the MTR and Vidyarthi debate was the most prominent with both places evenly poised. 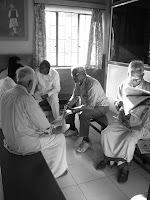 MTR is two storied has a smoky, old world look with waiting benches and and easy and relaxed waiters with barefeet, knee length hitched lungis. The dosas served with ghee and chutney (sambhar on request), Th e idli and khara bath (a kind of upma) are served with chutney and sambhar and when they run out of chutney and sambhar, which they often do at 9am.They serve these with a potata gravy (the kind eaten eith pooris in south India). The service is relaxed, there are some oldies and senior citizens having their weekly bash. This is heartland Kannadiga belt of Bangalore. Anyone who believes Bangalore is truly cosmopolitan, needs to do a reality check after visiting Lalbagh, MTR and Gandhi bazaar. The whole experience is very different from any other south Indian food experience ever before.The prices, idli, Rs10/- Masala dosa 20/- Kesari Bath/ Kara Bath Rs 20/- cofee Rs 15/- any which way you van eat very well under rs 100/-. They encourage you to visit their enormous and clean kitchen.Basically a place to come in regularly and when one is not in a great hurry. Relax ! is the tone. Now Vidyarthi Bhavan, it comes highly recommeded by the locals, has a huge fan following, its the unglamorous but more talented of the two siblings. The take on dosas is very different, almost a thick caramellised crust. The tast lingers on for hours, the service is unobtrusive and prompt. Our waiter Vasu has spent over 20 years at the outlet in Gandhi Bazaar. We order idli , vadas and dosas and coffee its Rs 17/- Rs 9/- Rs 12/- Rs 6/- respectively. I remember I went with my wife Praveen, who was visiting Bangalore, we both ate very well for Rs 75/- in all. It was Ganesh Chaturti the whole of Gandhi Bazaar wore a very festive look. Decked with flowers vegetables and fruits. The restaurant is very ordinary, a blink and you miss it. Situated in about a 200 sq metres plot of land, squeezed between shops. Its long narrow hall, with a cash counter as you enter. Both these places as you can see with the menu boards attached, offer a meal fore under Rs 100/- (definitely recommended for my Salesman's guide to eating out). My vote definitely goes with Vidyarthi Bhavan for the food, umm the taste lingers on and MTR for the experience. 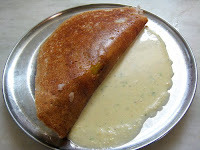 My question to you, can you recognise the Vidyarthi Bhavan dosa out of the two attached pictures. Walking in the park with my Junkie friend Sanjoo in 2006, he mentioned a non stop state roadways that goes from Delhi to Rekong Peo (in Kinnaur, located on the Old Hindustan Tibet trade road/route). I had to go there. Tried a couple of times, something or the other came up.Finally, I and Sandeep Gupta walked into the sunset all set for a 20 hours, 800 kms and Rs465/ journey. We left Delhi in the HPSR (Himachal Pradesh State Roadways) bus on Wednesday October 01, 2008 evening at 8.10 pm . Reached Rekong Peo with 5 halts (including nature breaks, meals, tea and temple halts and two tyre punctures) at 5.15 pm on Thursday 02, 2008 .Not satisfied with journey so far and the PWD rest house at Rekong Peo we went further 13 kms and a few hundred metres above sea level to live at the beautiful village Kalpa and the very nice Circuit House. Offering perhaps one of the best views of the Kinner Kailash range and the legendary Shivling, Parvati Kund, Jorkandan peak and the adjoining Raldang snow clad mountains. We made the trip of 4 nights, 1800 kms and 12 meals and entertainment of IMFL and other miscellaneous within Rs 3000/ a person. This sounds unbelievable for the price of a night out at a pub we explored within ourselves and the world outside for US$ 65 (at current conversion rates) and enjoyed the whole experience. We ate well, lived well and drank well, it seems amazing. We did not start with a budget, somewhere half way in the trip we decided to beat the inflation and do it under Rs 3000/- and live to tell the tale. Reekong peo is the District HQ of Kinnaur and Kalpa is the erstwhile District HQ and now declared aUnesco heritage village. It has a thousnd year old buddhist monastery which was burnt and then again rebuilt in the 50s. Kalpa was an outpost on the Old Hindustan Tibet trade road and route and strong junction on the Silk route. Walking in the same park this time with Mr Chaterjee and and Mr Mehnditatta (as I fondly call them) , they mentioned about the Kinnauri Apsaras, mentioned in the Vedas and the Puranas, and their celestial beauty. We ratify that Lord Shiva, was right, to come to the legendary village of Kalpa as his winter abode. The women are pretty and easy to talk to. We even visited a local house to buy the local brew called Ghanti (bell, does ring a bell, made from apples, apricot and grapes) and the women wanted to chat up and next day in the village square they were again chatty. Kinnaur is the apple orchard haven and each house is allowed to make 24 bottles of local wine for their own consumption and for religious purposes. Ghanti comes in two formats, light and strong, the legendary stuff comes from a village called Ribba. To test the potency, you dip your finger and then light the fire, the liquid burns and your finger is intact, thats strong and that retails at Rs 100/ a bottle and the light one is like a potent wine and does not light up retails at Rs 50/. We hated it and gifted the only bottle we bought to the Circuit house staff Joban Dass the housekeeper and Narendar the cook at Kalpa. The main occupation in the valley is apple farming. The variety is the Royal Red and Delicious which are red and very juicy and very crunchy they sell at wholesale price ranging from Rs 800 to Rs 1200 for a cardboard box of 20 kg. This year the apple farmers were worried, as the size of apples is very small and they were red and ripe even at the size of a plum. Most attributed it to ecological imbalance and change in climatic conditions. The ecological imbalance can be attributed to the creation or devastation (depends on how you look at it) of the several hydro electric power plants of HPEC (Himachal Pradesh Electricity Corporation) Jaypee Group who are collectively producing 3000 MW through several plants at Nathpa Jhakri, Baspa, Karcham, Wangtu and so on. Basically they are trying to harness the wild apaloosa of a 1500km long Satluj river. Block it , divert it, tunnel it. As a result the constant blasting has led to the place looking like a war torn territory and shaken the foundations of the mighty mountains. Resulting in landslides and silting of the river. It looks like a serious catastrophe in waiting. WE were lucky to stay in the HP PWD Circuit house at Kalpa, with hot meals, hot water, warm beds and heated rooms, all for Rs 200/- a night, inclusive of tips we paid Rs 600/- for everything for two nights. We stayed in the old wing which was a wooden bungalow of the British era, with two bedrooms, two toilets, dining room and a lounge with glass windows with a view of the snow clad mountains.On the way back we stayed at Narkanda, HP Pwd Rest house another British era rest house spent two hundred rupees for dinner and stay of two persons for the night. The food on the trip was average to poor as Himachalis are average cooks and could not savour the non vegetarian cuisine as I was a vegetarian, so no momos, thukpas and Khadus (mountain goat) and Bhedu (sheep). We stuck to the Aloo Paratha, Puri Aloo, Cutlets for breakfast and Rajma Rice, Roti, Vegetables and Dal for Lunch and Dinner. The locales made up for the lack of gastronomic appeal. As my grandfather often said, great locales, poor food, poor locales great food. We did challenge ourselves to some degree, of our physical limits travelling 40 hours in a bus out of the96 hours we stayed out, walked for 11-12 hours and were shooting the breeze and sleeping the balance 44 hours. The last time I did anything close to the this physical exhaustion was when I drove down alone in an Opel Astra in 27 hours from Mumbai to Delhi (in 2000), while truckers take 72 hrs. It did rejuvenate me and makes me feel alive. We got to do a day climb, to a peak called Chaka above Kalpa at about 15000ft. It had a water source called Chaka and a small lake. It was like a pasture land for the summers. Truly Lord Shiva chose an ideal place to relax through winter.